Band Uniforms – the Calgary Round-Up Band is known for our white cowboy hats and blue uniforms; however, with the growth in our band we currently do not have enough uniforms are all band members. In 2013 we have grown to nearly 200 youth member, we need uniforms to outfit the entire group – Costs for the new dress uniforms is $75,000. Equipment Truck – with the increasing number of youth and performances, results in additional equipment and the current truck is too small – Cost for a new equipment truck is $60,000. Rehearsal Space – securing rehearsal space adequate for 200 youth rehearsing for concert band, marching and field show competitions is a challenge. The annual cost of rental space is $50,000. 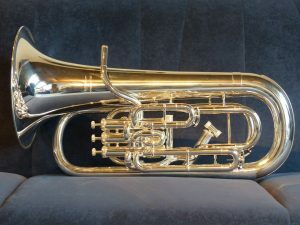 Instruments – with the growing number of youth in Calgary Round-up Band and many school band programs in flux, instrument purchase and replacement needs have increased. Cost of instrument purchase and replacement is $50,000. Financial Assistance – the Calgary Round-Up Band does not exclude those youth that want to be part of our band. There are always opportunities to assist band families in need, ask for details. To explore opportunities, please contact us to discuss how we can build a rewarding opportunity for you or your company in support of the youth of Calgary and surrounding area.